“If you like eagles and nature and getting caught in the rain. If you hate the thought of pollution and have half a brain. If you love making things better in a fun way, by hosting an event. 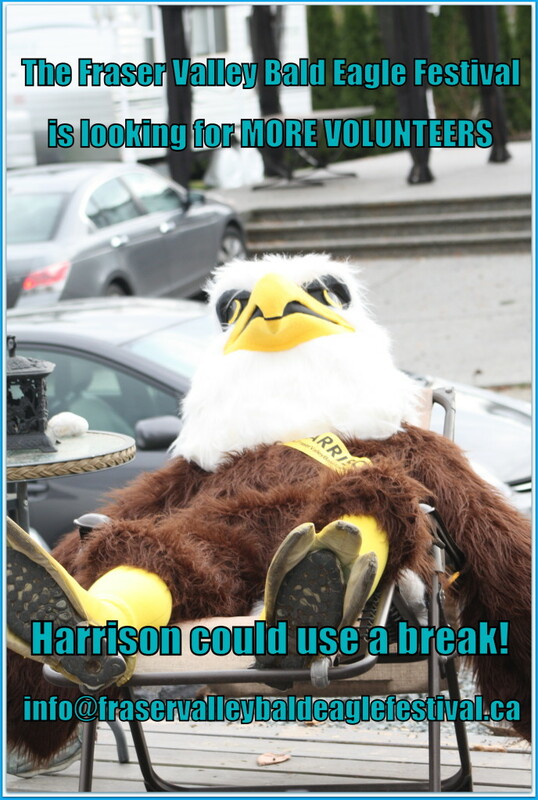 The Fraser Valley Bald Eagle Festival Committee is looking for volunteers to join this fun group of nature enthusiasts to help us create our annual festival. Each year the event continues to grow so we need YOU to keep it going. Drop us an email or visit the website to find out more about the Society. Some of our volunteers come out to monthly meetings and others volunteer during the November festival weekend. Festival Weekend Souvenir & Information Table Attendant- This position would be basically helping set up the main “FESTIVAL” table at Leq’a:mel Hall on Friday 3 hours, a Saturday shift 5 hours and Sunday shift and clean up 6 hours? If you are interested in any of the above please let us know and please share with anyone. We provide our volunteers with lunch on the Festival weekend, some SWAG of course and we have a dinner in December to celebrate surviving another year!